Use this Photoshop-like color picker to help choose colors for your websites, programs or office applications. Displays Decimal, RGB, VB and HTML color codes for each selected color. Now you can use this Photoshop-like color picker to help choose colors for your websites, programs or office applications. Webmaster Color Picker displays HTML, RGB, VB and Decimal color codes for each selected color. Pick and compare colors, convert to RGB, decimal, vb and other formats! 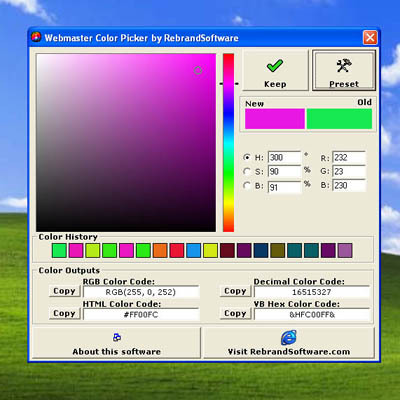 ...... Webmaster Color Picker displays HTML, RGB, VB and Decimal color codes for each selected color. * You can see the last 18 colors you have selected in order to pick the colors that match best! * Select from millions of colors! * 18 color history lets you see how colors match! * Displays colors in RGB, Decimal, VB and HTML color codes! * Templates for 256 web-safe colors! * Save your colors to the program pallette to use them later! * Does not Contain any Adware, Spyware, or other Third Party Software. * A brandable (a.k.a. Private Label) version of this software, with full resell rights, is available now. Advanced color picker which can get any color from any screen. The world's coolest Color Picker! Pick any colors from your PC screen with 14 formats. Handy little color picker displays html and RGB values for that color. Dynamic visual hex & rgb color picker with a twist! Qweas is providing links to Webmaster Color Picker 2.1 as a courtesy, and makes no representations regarding Webmaster Color Picker or any other applications or any information related thereto. Any questions, complaints or claims regarding this application Webmaster Color Picker 2.1 must be directed to the appropriate software vendor. You may click the publisher link of Webmaster Color Picker on the top of this page to get more details about the vendor.